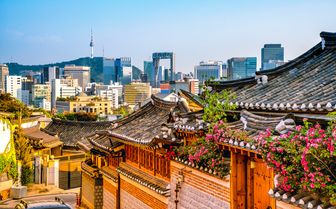 In a joint venture with Korean Air, Delta announced that its customers will have access to more than 80 Asian destinations and a world-class customer experience at Seoul-Incheon’s new Terminal 2, the home of Delta and Korean Air. Delta will utilize newly refreshed 777-200ER aircraft with all new cabins on the new route. Schedule details of the service will be announced in the future. The announcement was also praised by Twin Cities’ business leaders. “Our greater MSP business community is thrilled that Delta has decided to add direct service between this market and Seoul, South Korea. It enhances our region’s global access and reach, and significantly increases our economic competitiveness,” stated Michael Langley, CEO of GREATER MSP. The Seoul route was a priority for the MSP Regional Air Service Partnership (RASP), a collaborative air service development initiative launched in 2017 by the Metropolitan Airports Commission and GREATER MSP. The RASP helps identify air service needs of businesses in the region and supports MAC efforts to engage airlines that could potentially serve those markets. The RASP is chaired by Thomson Reuters Executive Vice President-Operations Rick King and former U.S. Bank Chief Executive Officer Richard Davis. Seoul will be the second city in Asia with direct service from MSP International Airport. Delta Air Lines also flies between MSP and Haneda Airport in Tokyo, Japan, and the airline also intends to deploy the refurbished 777-200ER aircraft on that route in 2019. Minneapolis-St. Paul International Airport (MSP) is preparing for a busy summer travel season and encourages Minnesota travelers to do the same. When schools let out, the airport gets busy, not only with families taking vacations, but also with summer campers leaving and arriving. MSP Airport’s Transportation Security Administration (TSA) team says it expects to screen an average of 37,400 passengers per day, an average daily increase of 1,125 people when compared to summer 2017 levels. 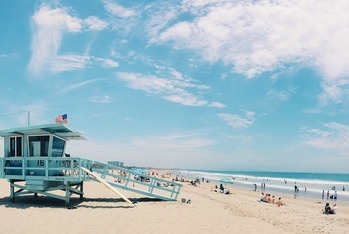 The busiest days of the week will be Thursdays and Fridays as well as Sundays and Mondays. The busiest times for security screening are expected to be between 5 a.m. and 9 a.m. and again between 2 p.m. and 4 p.m. daily. On peak travel days, the Metropolitan Airports Commission (MAC) plans to provide additional workers in the departures lobby to help speed the security screening process. Travelers should arrive at least two hours prior to their departure time to provide enough time for parking, check-in, security screening and getting to their gate. New carry-on baggage screening procedures are now in place at all airports across the country including MSP. The procedures require travelers to place all electronic devices larger than a cell phone – including tablets, e-readers and cameras - in bins for x-ray screening when going through the security checkpoint. The electronics should be placed in a bin with nothing on top or below, similar to how laptops have been screened for several years. For those who prefer to arrive at the airport even earlier, there are many new dining and shopping options, as well as activities to keep you entertained before your flight. For instance, at Terminal 1 you can: check out the Best Game in the World exhibit at the Thomson Reuters Concourse C Art Gallery, play a round of virtual golf at PGA-MSP, give your kids a workout at the children's play area, or watch award-winning, regionally produced films at the See18 film space. At Terminal 2, don't miss the new permanent art exhibit near gates H10-14. There's also a new Starbucks near gate H5. Here's to starting your vacation off right! Minneapolis-St. Paul International Airport’s ongoing improvement work at Terminal 1 includes a complete overhaul of the main food court off the airport mall. While the food court is now closed, there are many other options just a short walk or tram ride away—thanks in part to the first round of concessions improvements that brought 15 new dining options to Terminal 1. 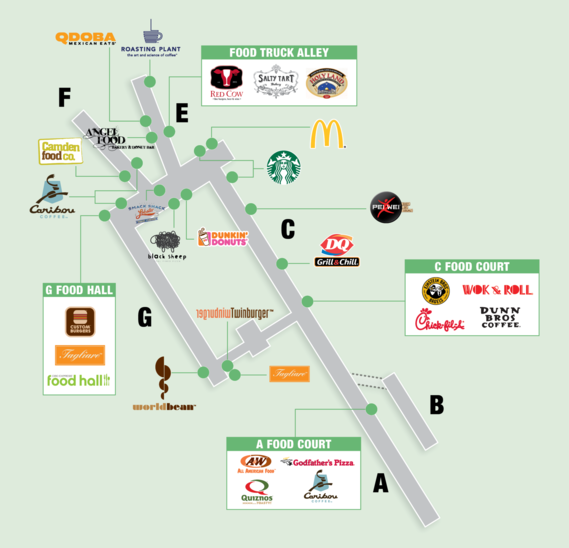 Your quick-serve and to-go options include: Smack Shack, Lake Wine Kitchen + Bar, and Black Sheep Pizza right in the mall; the Cibo Food Hall at the top of Concourse G; Food Truck Alley on Concourse E; and several venues on Concourses A & C. See map below for a full listing. 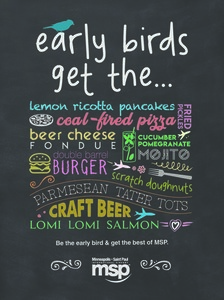 Current quick-service options at MSP's Terminal 1. When completed, the redesigned food court will feature six new dining options and more seating. A new two-story addition will provide sweeping views of the airfield and an abundance of natural light. First to open will be the two concepts that flank the food court: Starbucks and Chili’s, which are slated to open this winter. The other restaurants will be located inside the food court. Those venues include PinKU, a local treasure that specializes in Japanese street food; Moe’s Southwestern Grill, an option for southwestern fare with a rock-n-roll attitude; Firehouse Subs, which steams its meats and cheeses to release a rush of flavors; Auntie Anne's, recognized for its freshly baked soft pretzels; and Shake Shack, a well-known national brand that will open its second Minnesota location at the airport. All of these concepts will open in late summer 2019.